Avella has always been dedicated to connecting its customers with the resources needed to make sound business and clinical decisions. 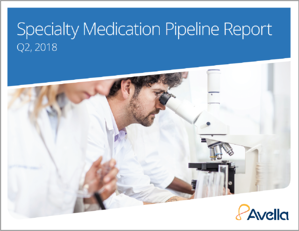 Now we’ve introduced yet another way to do just that, with the release of our 2018 Specialty Medication Pipeline Report. This report includes details about all of the specialty drugs expected to receive FDA approval in the coming months including indications, approval status, anticipated costs, clinical considerations and therapeutic alternatives, among other key data points. The report also provides helpful explanations of the various designations and approval processes undertaken by the FDA for specific types of medication such as orphan drugs and breakthrough therapies. The Specialty Medication Pipeline Report is especially useful for healthcare providers and payers looking to gain a perspective on treatments that may soon be available to patients. It may also be valuable to drug manufacturers looking to size up their competitive environment. This first issue contains information about 19 new drugs slated for approval in the second quarter of 2018, including therapies for cancer, inherited disorders, enzyme deficiency, as well as other acute and chronic conditions including rheumatoid arthritis, opioid use disorder, epilepsy, sickle cell anemia and severe neonatal jaundice. In fact, the pipeline for specialty drugs continues to be an area of rapid growth overall. Last year, the FDA approved 56 new drugs, 34 of which were specialty drugs. Seventy-seven percent of these applications were granted through a prioritized review process. Fortunately, Avella can help your organization keep pace with the rapid changes going on in this market.